Cell-concrete also known as cellular concrete, foamed concrete, foam concrete, light concrete, aerated concrete, porous concrete, etc., is popular because of the increasing requirements for greater energy efficiency in the construction of buildings today. Cellular concrete is a low density concrete made of cement, sand, water and foam mixed in various proportions to result in densities ranging from 20-150 lbs/cu.ft. High strength with low density causing little stress on the substructure, reducing soil settlement. Cellular structure provides valuable thermal & sound insulation. Stable in size and shape, does not change while setting. Flows easily and does not require compacting and leveling. Has excellent water & frost resistance. Light weight when precast makes it easy to handle, saves labor costs. Stationary Machine Model # CCM100S is used in plant to make concrete blocks or other precast shapes. The machine operates in manual or semi-automatic mode. In semi-automatic mode the amount of water and foam is delivered at preset quantities. The sand and cement are loaded manually. The foam water to concentrate ratio can be preset as needed. The amount of foam injected in the mixing chamber can also be adjusted as required. The machine can pump concrete to the forms without the help of an external pump.The mixer has the capability to deliver 5-10 m distance to the forms. The mixer chamber is pressurized to help deliver the concrete and to clean the machine. The machine must be washed after use. This machine is identical to the stationary model except it is mounted on wheels and it can be carried to the site to make and deliver the cell-concrete. 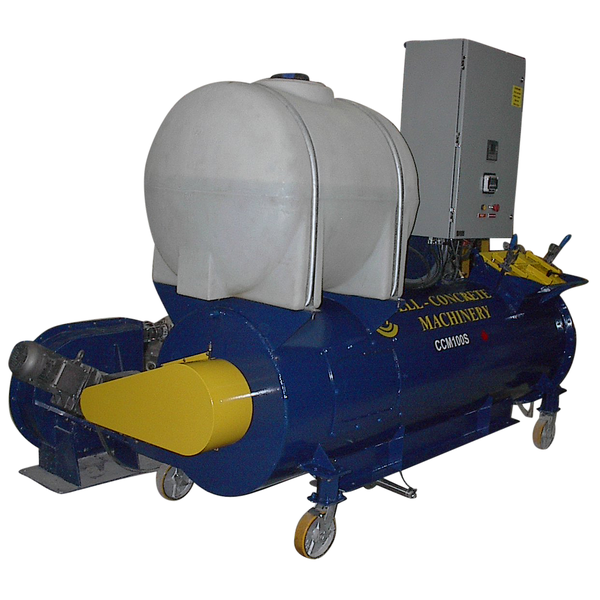 It is equipped with a peristaltic pump and optionally with a compressor and / or a power generator. Cell-concrete machinery is just one type of machinery that Optimex Engineering can design and manufacture. Click here for more information about our custom machinery.